database (2001) is an electronic reading device that deals with the inversed functionality of three technologies: a printer, a video camera, and a database. 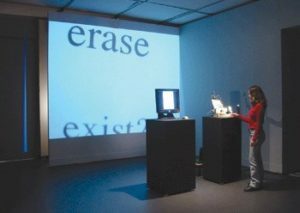 As such, it raises issues about the erasure of text, the act of reading in real time (i.e., listening to a printed text), and physical databases. We challenge the idea of the database as a non-linear and digital structure and the printer as an output device as well as an information recorder. Our aim is to question the traditional meaning of computer interfaces. We achieve this by inverting their basic functionality. The installation deals with the opposition between presence and absence, recording and erasing, memory and forgetfulness, present and continuous time, reading and listening. These concepts are connected with the idea of present time as a time that is always passing by. In collaboration with Fabian Winkler. Nominated in the Japan Media Arts Festival / Digital Art (Interactive Art) Division. Award-winning project in the ACADIA 2002 Digital Design Exhibition (Pomona, CA – Oct. 26th). Presented in File Symposium 2002 (Festival Internacional de Liguagem Eletrônica). São Paulo – Brasil / August. Exhibited at the Electronic Literature STATE OF THE ARTS Symposium. UCLA – April 4th-6th. Reviewed in the LA TIMES: Opening the Book on Literature’s Future. April, 14th.